Resources in the Bookings module. For each of the above features you can set the visibility - either to All Users (i.e. all ChurchSuite users, not all church members! ), Just me, or to one or more User Groups. 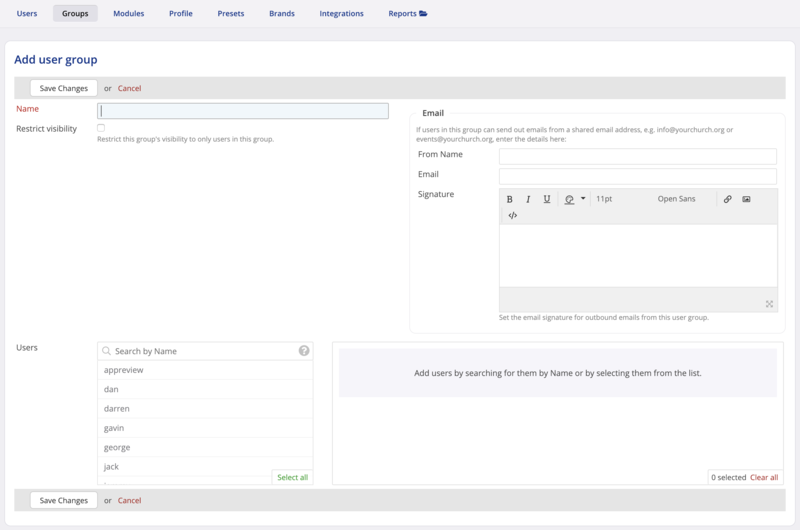 You can set the visibility of a User Group. 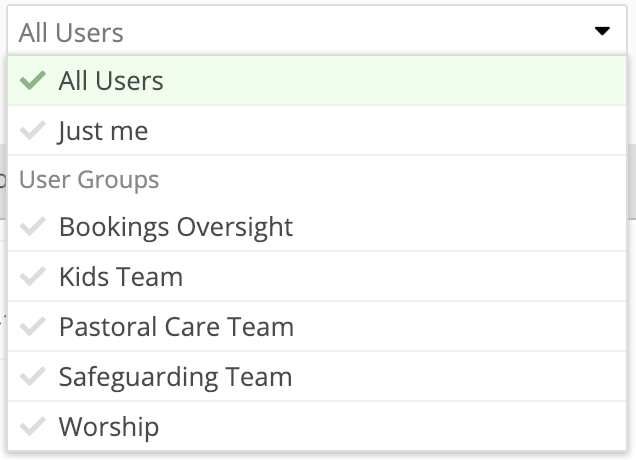 By default User Groups are only visible to the group's members. This means that even the existence of the user group and any content restricted to that group is only visible to user group members. It's also possible to make a User Group visible. This means that the existence of the user group is visible to any user, while still keeping the feature's content restricted to the group members. For example, you might have a "Safeguarding" User Group that you want to be visible to all users so that any user could add a private Note and restrict its visibility to just those in the Safeguarding user group. While any user could then add a private note for the Safeguarding user group, they would still be prevented from viewing any other notes restricted to the Safeguarding user group. The Add user group page opens. Give the User Group a suitable Name, set whether to Restrict visibility of the group to only users in the group, and then search/select each of the Users that are to be added to the user group's member list. Note that the group can be assigned a shared Email address - when sending emails, users within the group can send on behalf of the group's email address as an alternative to their own User email address (see the related support article). Click Save Changes before navigating away from the page. Now, when adding or editing any of the features listed above, such as a Note, the user can select to restrict the note's visibility to a user group. Only user groups that do not have visibility restricted and user groups the user belongs to will be visible in the drop-down list. Deleting Users and User Groups - Warning! 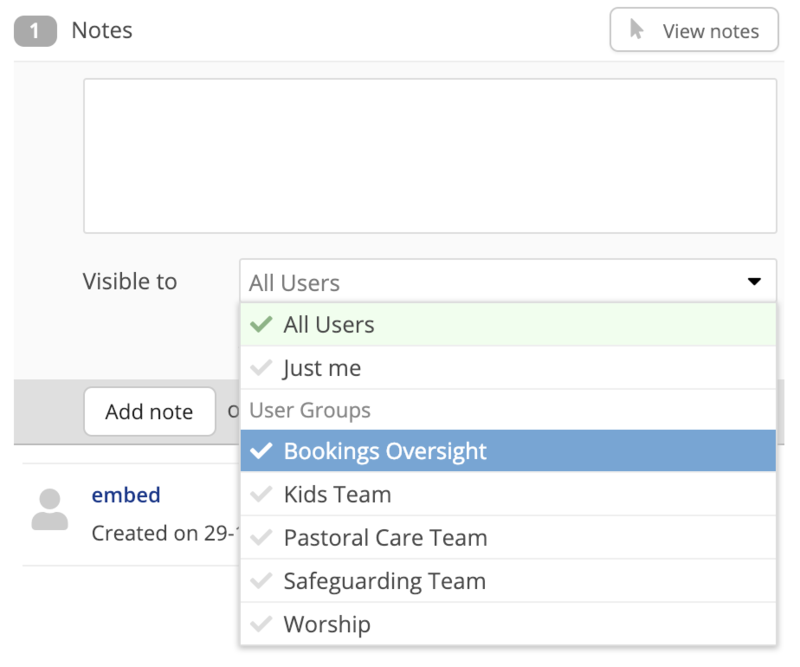 Before deleting a User or User Group, consider whether any notes, tags, key dates, flows, booking resources, leave setup or presets have their visibility restricted to just that User Group. If you proceed with deleting a User or User Group, no users or administrators will be able to view those notes, tags, flows etc - they will be hidden from view. This is intentional in order to respect the original visibility restrictions that were intended to ensure privacy of those items. Therefore, before deleting a User or User Group, update the visibility restrictions of your notes, tags and flows - either to "All Users", "Just me" or to an alternative User Group; then proceed with the user or user group deletion. Once a User or User Group is deleted, only the ChurchSuite Support team can restore the visibility of those hidden items.